The leading independent specialist for windscreen replacement and windscreen repair based in Portsmouth and serving all of the Portsmouth area. National Windscreens Portsmouth fitting centre provides windscreen replacement and windscreen repair services to businesses and individuals throughout Portsmouth and the Portsmouth area. 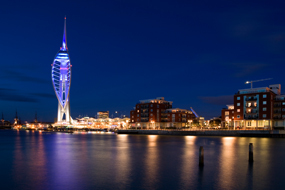 Portsmouth is the second largest city in the county of Hampshire, and is located on the south coast of England. The M27 provides quick access to Southampton in the west of the county, whilst the A3(M) allows access to the north and to London. In recent years large amounts have been invested in a waterfront development. This has seen the opening of many high end retail shops as well as the 170m Spinnaker Tower. The Portsmouth windscreen fitting centre and its mobile vehicle glass technicians service the needs of Portsmouth and the surrounding area including Bognor Regis, Chichester, Havant and Fareham. With 108 fitting centres and over 800 mobile technicians, National Windscreens operates the UK's largest windscreen repair and windscreen replacement network. The company provides low cost, high quality windscreen replacement and windscreen repair from its Portsmouth fitting centre 24 hours a day, 7 days a week, 365 days a year. Repair and replacement of all types of vehicle glass including windscreens, rear windows and side windows is undertaken throughout Portsmouth and all of the Portsmouth area.